Kitchen Cabinet Hardware Under .70 ! Kitchen Cabinet Hardware Under .70! Kitchen cabinet hardware can be very costly. And it’s the reason that we never added these to our kitchen when we were building our current home. We had already added lots of upgrades, but when it came to adding kitchen cabinet hardware, we were already over budget. One day while I was shopping at the thrift store, I came across a huge bin of shiny gold knobs. They were not my style at all, then it hit me. Why not update these knobs and make it my style with a little paint! So I did! These knobs were super cheap. With the purchase of my paints, I was able to add kitchen cabinet hardware for $20.00. Which comes out to around .67 each! I have 35 cabinets, if I had purchased brand new hardware I would have paid over $100 easily! Today I want to share a technique that I used on my knobs to update them. When I decided to add kitchen cabinet hardware I knew that I wanted to create an aged copper look. If this isn’t your style no biggie. 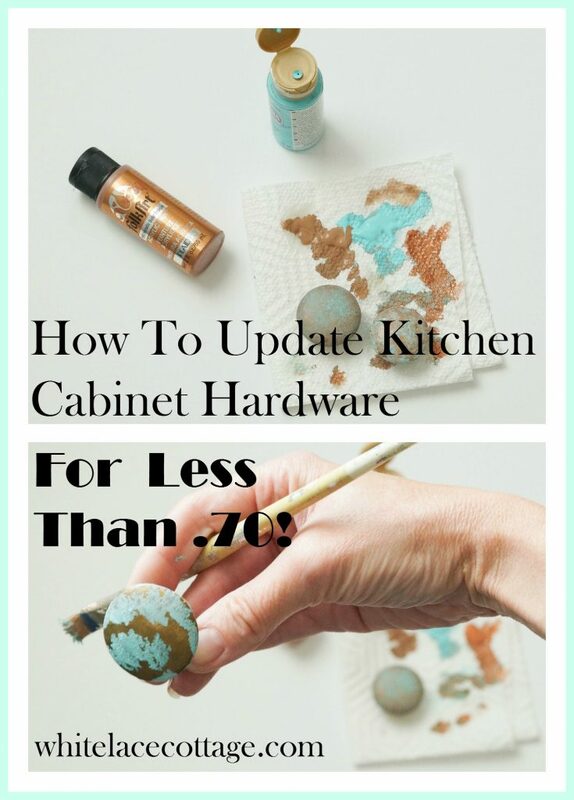 At the end of this post I’ll share a few tips on how to add any paint color and update your kitchen cabinet hardware. 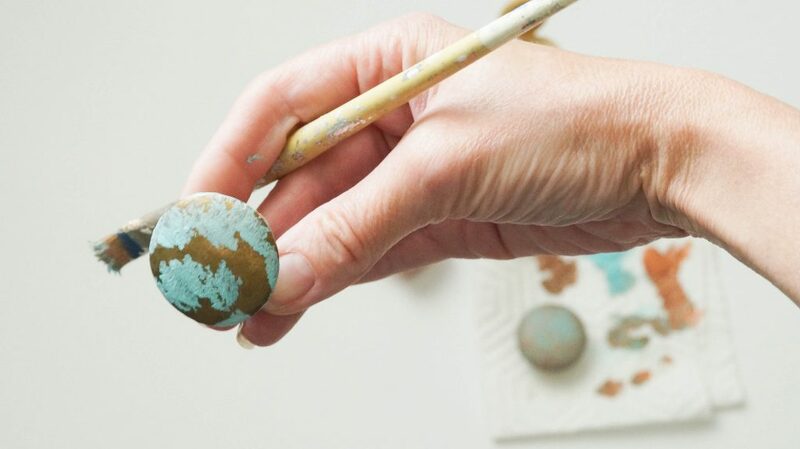 If you’re painting on a metal knob or handle, make sure you lightly sand each piece. Then wipe off the dust. Spray primer on your hardware and let it fully dry. I didn’t have a metal knob to share, mine is actually wood and it’s painted gold which was a great background already. Your knobs will be white from the primer. 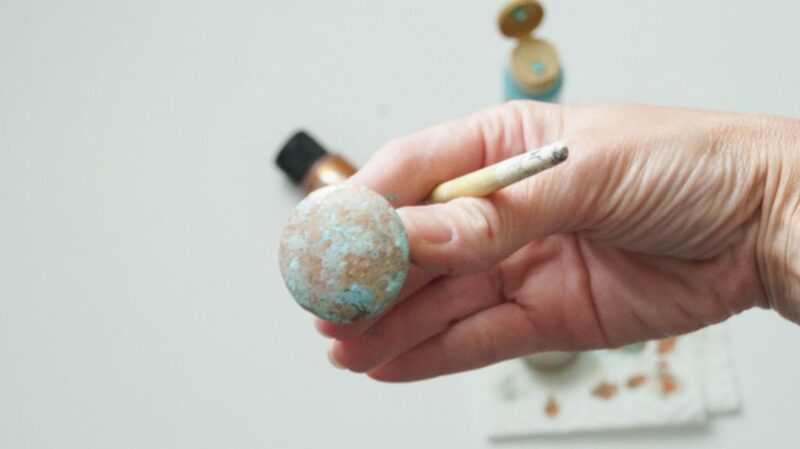 Using your craft paint brush apply Bahama Blue on your knob. Make sure you completely cover it. I just stippled mine because I had gold background. Next, stipple Sable Brown on your knob. 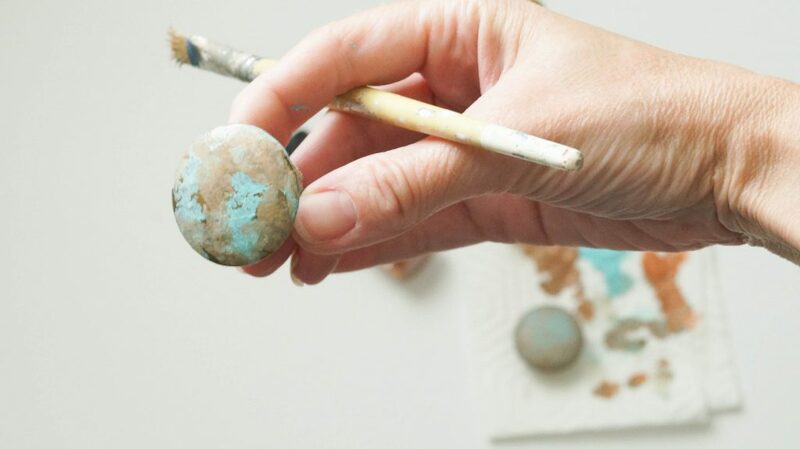 Stippling is when you take your paint brush and in a pouncing motion, you apply the paint. Don’t cover all of your Bahama Blue. You still want to see that green. You don’t have to wait for each coat to dry. Now were ready to add metallic bronze. 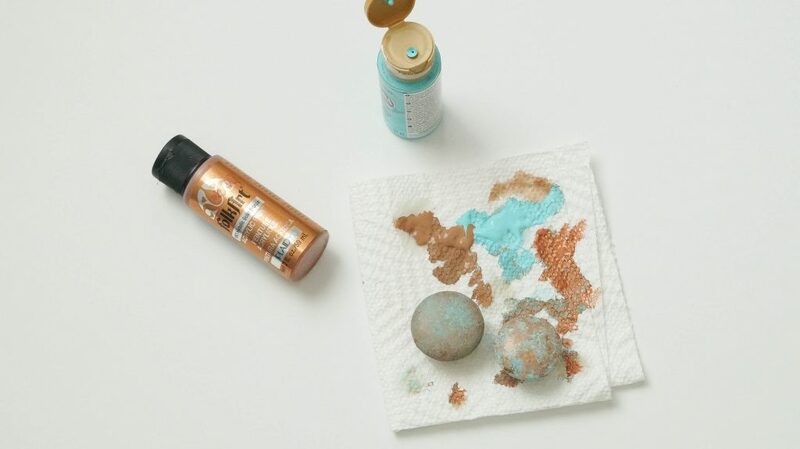 I could have purchased a copper paint and you can do that. But I liked this color better as it’s not as bright and I wanted an aged look. I took my craft paint brush and stippled this on top of the brown, again, making sure not to cover all of the green. If you feel that you’ve over done it with any color, go back and add more of the color you’d like to see. Let your kitchen cabinet hardware completely dry, then spray a clear gloss or matte finish on them. And that’s it! The knob on the left is dry, the one of the left is wet, that’s why they look a little different in color. And here’s my kitchen cabinets with my hardware. This was taken last summer, but you can see the hardware on my cabinets. I found these knobs and pulls at my thrift store. Yes all of them. If you like this technique that I used on my kitchen cabinet hardware, here’s a tutorial that I did on a plastic mirror. You can see that transformation and tutorial HERE. If this look is not for you here are some ideas of how you can update kitchen cabinet hardware and where to look for knobs and get the best and cheapest price. Don’t worry about the color or finish on a piece of kitchen cabinet hardware. With a little paint you can paint it any color you want. They even have spray paint in metal finishes. Look for kitchen cabinet hardware at thrift stores, garage sales and even in the clearance section of a home improvement store. Use craft paint if you’re wanting to create a finish as I did. Look for sales on spray paint to make it even cheaper. 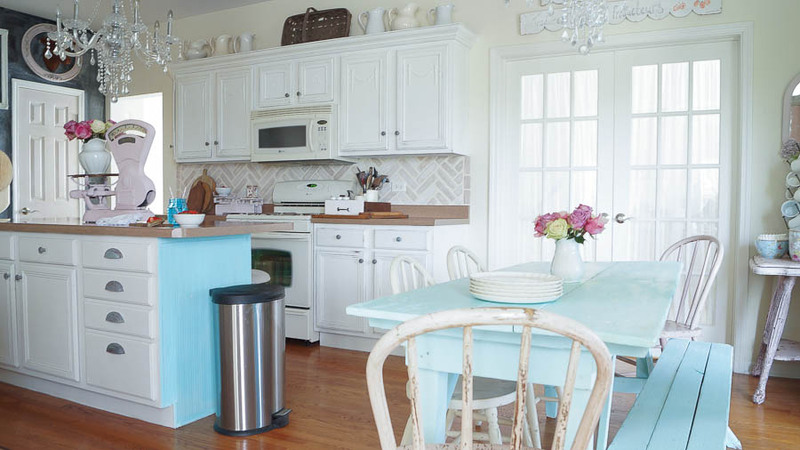 If you want to paint your kitchen cabinet hardware a color, but you want to distress it you can do that. But remember that whatever the base color of the hardware is, that’s what will show through once you distress it. I would look for darker hardware if you were going to paint knobs or handles white. To distress it, I would use a fine sanding block. 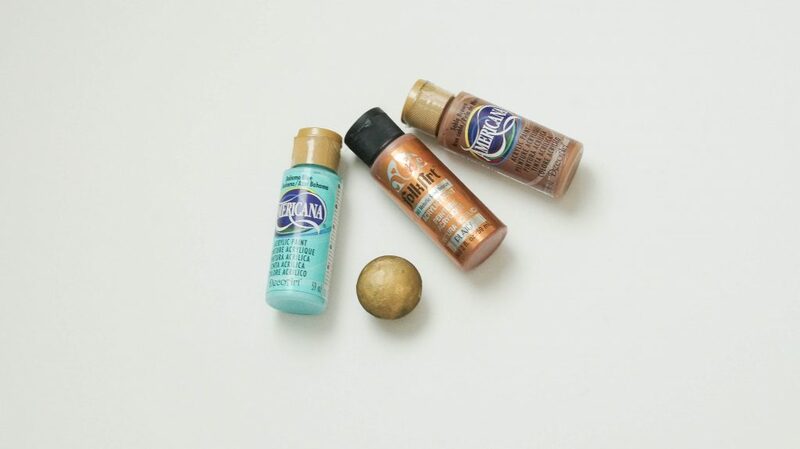 Or get creative with craft paints and create a faux distressed finish. If you want to create the look of brushed metal I would recommend this spray paint. I’ve used it several times and have had great results. If you’re nervous about drilling holes in your cabinet doors, here’s a super easy way. I promise this works perfectly! You can read about it HERE. I hope that this is helpful information if you’re thinking of adding cabinet hardware, but didn’t think you could because of the cost. It’s very affordable with these tips and tricks that I’ve shared.